This monumental stainless steel obelisk by Daniel LaRue Johnson (b.1938) commemorates a titan of 20th century diplomacy: Ralph Johnson Bunche (1904-1971), the American educator, political scientist, and United Nations mediator. For a lifetime of extraordinary achievement in the international arena, Bunche received the Nobel Peace Prize in 1950, the first African American to receive the award. In 1963, President John F. Kennedy awarded him the U.S. Medal of Freedom. As a U.N. mediator, secretary for special political affairs, and supervisor of peace-keeping missions in the Middle East and elsewhere, he played a key role in brokering U.N. sponsored peace agreements from 1949 to 1970. Even before Bunches death, noted African American sculptor Johnson conceived of this towering 20-ton sculpture as a testament to Bunches dedication to world peace. Johnsons father had been a high school classmate of Bunche in California, and the sculptor was greatly influenced by Bunches diplomatic efforts. In 1970, a sculpture by Johnson in memory of Dr. Martin Luther King Jr., then the largest Cor-ten steel sculpture in the world, was dedicated in Minneapolis, Minnesota with Ralph Bunche present. The Phelps-Stokes Fund, on whose board of trustees Bunche had served, led the campaign to raise more than $500,000 to erect the monument and re-landscape the surrounding park. A resolution of the U. S. Congress effective October 1, 1979 endorsed the project, and authorized a federal appropriation of $485,000 towards its completion. 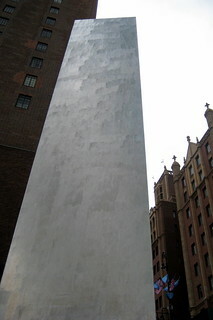 The full-sized obelisk was fabricated by Lippincott Foundry of North Haven, Connecticut. On September 15, 1980 the sculpture was formally dedicated with a ceremony held at the U.N. General Assembly Hall followed by the unveiling of a plaque at the monument by Mrs. Ralph J. Bunche. Participants included U.N. Secretary General Kurt Waldheim, Vice President Walter Mondale, the Reverend Theodore Hesbrugh, president of the University of Notre Dame, Mayor Edward I. Koch, Congressman Charles Rangel, and Parks Commissioner Gordon A. Davis, among other dignitaries. Seth McCoy of the Metropolitan Opera and the Boys Choir of Harlem performed musical selections. The monument--a contemporary interpretation of an ancient art form--is a perpetual reminder of a great man and the international peace, which he sought to advance.